For most conspicuous bravery. From 7 p.m. till midnight he searched ‘No Man’s. Land,’ and brought in three wounded men. Next morning at 8 a.m. he continued his; search, brought in another wounded man, and gave water to others, arranging for their rescue later. Finally, at 10.30 a.m., he took out water to another man, and was proceeding further on when he was himself killed. All this was carried out in full view of the enemy, and under direct machine gun fire and intermittent artillery fire. He set a splendid example of courage and self-sacrifice. 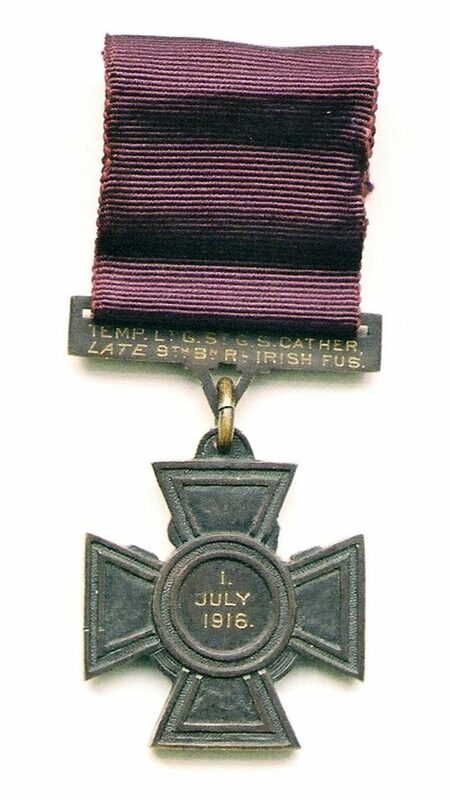 Cather’s body was recovered on 3 July and buried at Hamel. 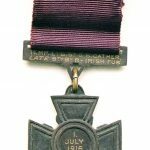 His remains were not identified during the post-war concentration of graves and he is commemorated on the Thiepval Memorial. 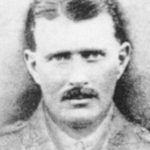 Major Cuthbert Bromley VC, 1st Battalion, The Lancashire Fusiliers. 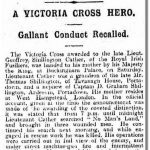 One of six recipients of the Victoria Cross earned by the 1st Battalion at Gallipoli during the landing at ‘W’ Beach on 25 April 1915. He was killed when the troopship HMT Royal Edward was sunk on 13 August 1915; Helles Memorial. 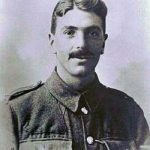 Sergeant David Jones VC, 12th (Service) Battalion The King’s (Liverpool Regiment). 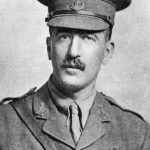 At Guillemont on 3 September 1916, he took command of his platoon when the platoon commander was killed and held a captured position for two days and nights. He was killed in action on 7 October 1916; Bancourt British Cemetery. 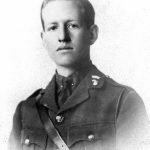 Commander Loftus William Jones VC, Royal Navy. 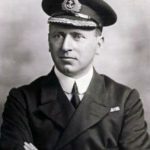 The captain of HMS Shark, who was mortally wounded at the Battle of Jutland but continued to fight his ship until it sank; Kviberg Cemetery. 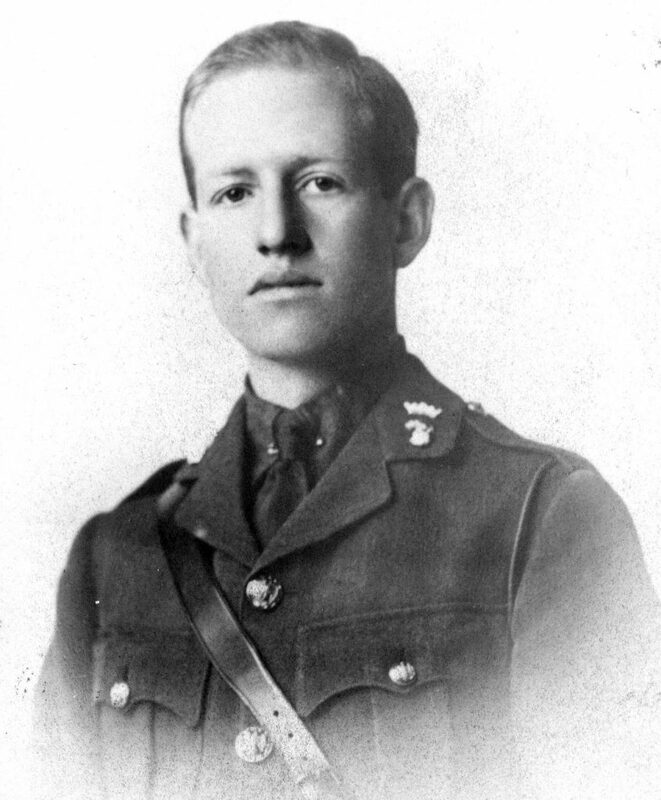 Major Stewart Walter Loudoun-Shand VC, 10th (Service) Battalion, The Yorkshire Regiment (Alexandra, Princess of Wales’s Own). Killed in action leading his men at Fricourt on 1 July 1916; Norfolk Cemetery, Becordel-Becourt. 1. (Back) Robert Gabriel Cather (1859-4 January 1908) married Margaret Matilda Shillington (9 May 1865-7 November 1939) on 1887 at . 2. (Back) Dermot Patrick Cather (21 May 1894-26 March 1895); Captain, Royal Navy, served at the Battle of Jutland and throughout the First and Second World Wars. 3. (Back) London Gazette 15 March 1917. 4. (Back) London Gazette 26 October 1916. 5. (Back) London Gazette 15 September 1916. 6. (Back) London Gazette 9 September 1916. Really enjoy your posts Nick.